though the open door. I asked and she gave me the permission. - Mexicans are definitely happy and friendly people by their nature. Nice photo of this woman. I love pictures that tell a story so well that you really don't need a caption. This is one of those shots. Great job! Great catch, lovely composition, and like the colors a lot. 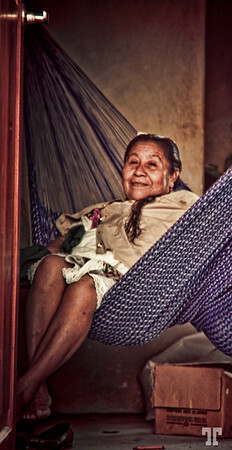 She does look like she's enjoying her evening relaxation -- and love her smile.